Tim Lee 3’s fourth and best release hankers for the excitement of the unknown lurking just around the next back road bend, offering a mature set of rock and roll songs about staying young at heart. It doesn’t take long, when Tim and Susan Bauer Lee share a stage, before Susan will amble over with her bass guitar and lean back into Tim as he plays lead. She’ll close her eyes, he’ll grin, and they’ll sway together as their notes merge, a private moment of connection shared with the crowd. Theirs is a rock and roll love affair that has spanned 30-plus years of marriage and more than a decade as band mates. 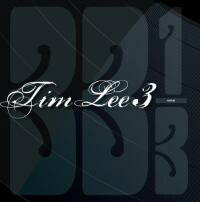 33 1/3 is the fourth Tim Lee 3 full length album, and the second featuring Chris Bratta on drums. It’s a special one for the Lees. They’re releasing the album on the day they celebrate 33 and one-third years of marriage, what they’ve dubbed their “vinyl anniversary”. With such a background, one might expect an album of quiet contentment, one maybe even wallowing in a bit of well-earned, self-satisfied smugness. What we get is quite the opposite, and it makes for a wonderful ride. Unlike their previous release, 2012’s excellent Devil’s Rope, which mined a vein of nostalgia for place and a sense connectedness, this album shimmers with a mood of restlessness, an itch to get on the road with no particular plan or destination in mind. That feeling is conveyed from the opening whump-whump-wah riff of “Baby Caught Fire”, a treatment of spontaneous combustion as a metaphor for escape. Jangle-pop follow-up “Photo Booth” combats Saturday night stay-at-home boredom with the warning that “Sittin’ on your hands doesn’t get you anywhere” and an invitation to “meet me at the photo booth” at the county fair for a tryst. The chorus of “Our Lady of the Highway” calls for rescue from the saint of the title while noting that “a gospel song on the radio / Is the only salvation I know.” Discontent with stasis combines with an urgent need for escape throughout the album’s 11 cuts “Going nowhere never felt so good”, Susan sings on “Magnolia Plates”, cooing an adventurous promise: “A few more miles and we’ll be out of sight / Everything baby’s gonna be alright. / We could vanish without a trace.” This mood of restless urgency infects nearly every cut. The only person content in sitting still is the drugged-out father in the darkly humorous cautionary tale “Daddy’s Girl”, who has found his own form of escape, blissfully zoned out in front of the television while his two lady friends cook meth in the kitchen. Musically, Tim Lee 3 has grown into a tight unit. Confidence abounds in the record’s many stylistic variations, with a psychedelic vibe dominating, such as in the warped reverb echo of the lead guitar in “Shut Up and Kiss Me” or the humid swampiness of the main riff in “Our Lady of the Highway”. Tim is a quiet virtuoso who can do any damn thing he pleases with a guitar, and does, but he’s the kind of player whose depth of talent sneaks up on you. It’s not that his playing lacks flair, it’s that his many sonic skills are so organically woven into the whole of each song that they don’t call immediate attention to themselves. Several listens in, one begins to realize that Tim’s playing on this album offers up a master class of inventive riffs and bridges, consistently evocative but never derivative. Susan has grown in confidence as a singer over the course of the band’s albums, and her vocals here show a growing skill set of variety, from playful, to pining, to forceful. On “True” she demands respect in a voice that breaks through in full-throated intensity. Bratta’s drumming, too, shows the kind of nuance and variety that comes from the near constant gigging that the band has undertaken over the past two years. Always a steady, driving engine for the band’s fast songs, he shows his range here, tapping out the passing road sounds on “Magnolia Plates” or working the toms like a heartbeat to anchor the anxiety of the unknown in “Where Things Get Lost”. The album is a full-on assault on boredom, a warning against taking life too seriously, and a clarion call to make every moment memorable. It’s the trivia we remember, after all, those quirks and accidents that make life meaningful. If there’s marital advice embedded in this amethyst anniversary release, it’s just that. Don’t ever stop looking for a good time together. As Tim sings on “Looking for the Door”, “Keep moving forward until you’re dead.” Good advice from a great album.